If you have the money and are looking for speaker that sounds as premium as it looks, the REMIX won't disappoint. V-MODA has quite a few pairs of headphones and plenty of people who love their products, and now you can add a Bluetooth speaker to their line-up. The REMIX is a Bluetooth speaker that aims for premium with modularity and a built-in headphone amplifier. Besides that you can customize every surface with custom materials and 3D printed accessories just like their headphones. So does it live up to the brand name? In the box you’ll get the speaker along with a few extra accessories. You’ll get a quality braided audio cable, a sturdy USB-A to USB-C charging cable, and four remix rings which are rubber square rings you can put around the speaker. Then of course is all of the warranty information and a quick start guide. The REMIX speaker comes in an aluminum and vegan leather options. We’re looking at the leather variant here. As far as design goes this isn’t going to redefine the way a speaker looks. Sure it’s a nice looking rectangular box, but it’s still a small rectangular box. Rather than reinvent the wheel, it seems V-MODA just took a form factor that works and put their own spin on it, i.e the custom 3D-printed accessories. This speaker takes the customizability a step further however, letting you change all surfaces of the speaker. This ranges from the vegan leather we’re looking at all the way up to materials like platinum costing tens of thousands of dollars. Up top from left to right you’ll find an LED status light, power button, volume down, multifunction, volume up, Bluetooth pairing buttons, and a tiny microphone. Then on the back of the speaker is a 3.5mm input, USB-C charging input, and Vamp output (more on this later). Overall, I wouldn’t say this speaker is meant for outdoor use or anything like that. Instead, it seems like it was made for a desk or bedside table. It’s a different kind of Bluetooth speaker than I’m used to, and I really like it. The connection was probably the weakest part of the speaker in my opinion. It’s not bad it’s just painfully average which doesn’t match up with the rest of the speaker. There’s a strong connection up to about 30 feet (which there should be) and anything passed that depends on what’s in the way. Again, this is all good but it doesn’t set the speaker apart from the crowd. I feel like a speaker that has a vision for the future with modularity USB Type-C should have a slightly longer range. Now with the negative out of the way, the strength within 30 feet was really good and I never had an annoying skip mid-way through a song while the speaker was on my desk. Besides that this speaker is only the second speaker I’ve ever tested that charges via USB-C, which is great. I’m all in for this Type-C universal future. But that’s not the only cool thing about the REMIX. V-MODA also included their own headphone amp in the speaker (cleverly named the VAMP). So if you have a pair of headphones that require a little more power, you can plug them into here just fine. There’s even a tiny orange light that glows from the input which is a nice touch and I enjoy the attention to detail. As far as playback options go the REMIX has you covered on all fronts. You can control volume, skip between tracks, answer phone calls, and access Siri or Google Now using the buttons up top. The buttons have a nice click to them and even after a few weeks of testing they didn’t get any annoying fingerprints thanks to the matte plastic finish. V-MODA claims a battery life of 10 hours, and in our testing that was spot on. We got around 10 hours and 15 minutes on a single charge. It’s worth mentioning that we do all our testing on max volume, so if you listen at moderate levels you can probably get it to last even longer. Still, even though the speaker hit its target on the nose 10 hours just isn’t that impressive. Sure it’s practical (ten hours is long enough if we’re honest about it) but when some speakers now come with a 24 hour battery life it’s hard to be blown away. One thing I noticed about the REMIX is that it doesn’t get too loud, so if you’re looking to really power a party this might not be the way to go. But on the flipside, it maintains a really solid sound throughout the volume. 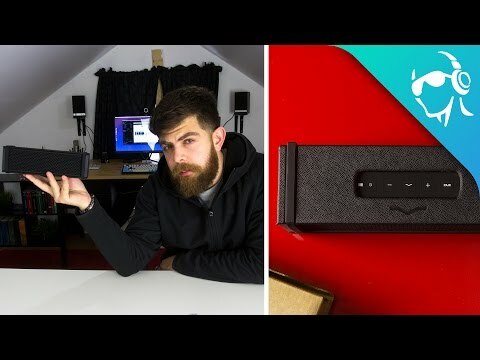 So if you want some background music for a get-together or even just want to use it on your desk or bedroom, this speaker sounds good at all levels. You can easily connect this to an Amazon Dot as well, giving you all the powers of the echo in a prettier and nicer sounding speaker. Lows are definitely on the stronger side and sometimes really rise a bit into the mids. The majority of the listening experience was great. For instance, the bass sounded great in the song ‘33”God”’ by Bon Iver. Bass notes played on piano had a beautiful resonance and when the drums kick in they add a nice layer of depth without being overbearing. But then in the song “Generator ^ Second Floor” by Freelance Whales, the bass is just overpowering when it enters in. It causes the vocals to do a weird shift where they start off low and then once the bass stops, vocals rise up again to their normal volume. It seems to be a hit or miss kind of thing. The mids sounded crystal clear, making vocals sound great save for the previous instance. The strength of the mids is really noticeable in Frank Ocean’s “Self Control”, where you can plainly hear the very slight reverb on his vocals while the backing guitar maintains plenty of detail. Highs are actually really nice for a Bluetooth speaker. They get just to the point of harshness without ever really becoming harsh, which is perfect. It preserves a ton of detail in things like cymbals and shakers. You can really hear this in the song “Girls” by Slow Magic which has a nice shaker throughout. Overall, I really enjoy this speaker just for listening. It does have a strong bass but it’s not in a bad way. More in the way that V-MODA headphones have a slightly stronger bass, just enough to make it fun to listen to. I do wish it got a little louder but that’s just me. I really can’t complain considering how good the sound quality is at low and high volume. I do like the idea of being able to 3D print accessories but even if you never do that, it’s still a good speaker to have. Battery could be better at only 10 hours and I actually find the headphone amp (or VAMP) to be both clever and useful, but my one real concern with this speaker is price. At $300, it’s a hard sell. Personally, I’d say it’s definitely worth it if you have money and want a speaker that sounds as premium as it looks, but not many people have $300 for a Bluetooth speaker. Still, if you do the REMIX sounds great and you won’t be disappointed. The Bluetooth portable speaker that sounds too big, too good to be true. REMIX is the culmination of three years of R&D involving dozens of engineers and over 50 prototypes to deliver uncompromising V-MODA award-winning sound and design along with unrivaled customization options. Measuring just over 8" (20cm) wide, REMIX is designed to go anywhere, delivering full-bodied sound wherever you go. Powered by a newly designed glass-fiber diaphragm and long coil drivers, REMIX also features a rear-mounted bass reflex port for an accurate, lifelike sound. REMIX is world’s first speaker featuring a built-in headphone amplifier to drive your headphones with unparalleled power. The included daisy chain cable lets you wire unlimited REMIX together for the ultimate, scaled sound experience. Amazon Alexa is also compatible via the Echo Dot to easily summon your voice assistant. This premium speaker -featuring a luxurious black vegan leather finishing - exemplifies the work of V-MODA’s Milano-based design studio: classically styled, beautifully proportioned and completely customizable to reflect the personality of its owner. In fact, REMIX is world’s first full-surface 3D printed custom product with the Hi-Fi speaker being the epicenter of 6 3D customizable surfaces. Patent-pending Remix Rings allow for 3D parts to be installed in materials ranging from fiber to platinum. Enjoy effortless Bluetooth connection within a 33 feet (10 meters) range and simultaneous pairing with 2 devices. The lithium-ion battery provides up to 10+ hours of music, entertainment and calls via the built-in speakerphone. Charge REMIX via USB-C, the gold standard of quickness and reliability.